Gordon Chin, one of four co-chairs of the Run Ed Run campaign to draft Interim Mayor Ed Lee into this fall’s mayoral contest, heads a nonprofit awarded $1,136,000 directly from Mayor Lee’s office this year, an increase of more than $200,000 over the previous year. 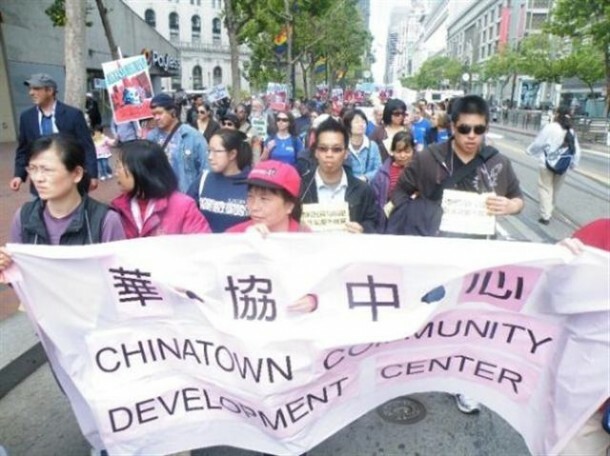 In total, Chin’s Chinatown Community Development Center received an additional million dollars from other city agencies. In May, Mayor Lee’s Office of Housing brokered an $8 million grant to the group for affordable housing out of the Central Subway funds in a decision sharply criticized as cronyism. Between 2008/09 and the current year, the nonprofit has received $8,017,767 in city contracts, according to the Controller’s records. During this period, Chin and at least one of his board members have made political contributions to members of the Board of Supervisors and to candidates for the Board, despite a 2006 law that bans contributions from officers and directors of nonprofits that are negotiating or receive city contracts. Chin contributed to David Chiu, John Avalos, Eric Mar and Sue Lee in 2008 and to Jane Kim in 2010. Board member Anne Halstead contributed to David Chiu, Claudine Cheng and Denise McCarthy in 2008 and to Janet Reilly in 2010. Although many board members and officers appear unaware of the contribution ban, the law states that city contractors are required to inform all those affected by the prohibition before negotiations begin. (3) At any time from the commencement of negotiations for such contract until. (B) Six months have elapsed from the date the contract is approved. (c) Prohibition on receipt of contribution. (b) at any time from the formal submission of the contract to the individual until the termination of negotiations for the contract or six months have elapsed from the date the contract is approved. For the purpose of this subsection, a contract is formally submitted to the Board of Supervisors at the time of the introduction of a resolution to approve the contract. Each of Chin’s and Halstead’s contributions was made during the blackout period specified in city law. Chin’s role as co-chair of the Run Ed Run committee falls outside the prohibition, however, since it is not a committee controlled by Ed Lee but instead seeks to claim that it is a “general purpose” committee. Ethics Commission Deputy Director Mabel Ng confirmed to CitiReport that the “Progress for All” committee, also known as Run Ed Run, has been called and asked to amend its filling to identify itself as “primarily formed to support Ed Lee for Mayor.” The committee has not yet submitted an amendment. As an independent committee, it still would fall outside the specific prohibition of the law, as well as outside the $500 cap on contributions to candidate committees. A CitiReport survey of the Controller’s records shows that there are 1011 nonprofits with city contracts. San Francisco spends an average of about $470 million a year in contracts with nonprofit agencies. About 400 of them have contracts that exceed $50,000 that is the trigger for the contribution ban. Asian American Recovery Services with current contracts totaling $19,617, 140. Ethics Commission contribution records show that some board members make frequent political contributions. Tenderloin Housing Clinic, with current contracts totaling $18,066,379. Records show that at least one board member made contributions during the black out period. Progress Foundation with current contracts totaling $15,896,167. Current records show that at least one board member made contributions during the black out period. Episcopal Community Services of SF with current contracts of $13,869,575. At least two officers or board members made contributions during the black out period. Baker Places, Inc. with current contracts totaling $11,463,245. At least one board member made contributions. Walden House with current contracts totaling $10,923,708. At least one board member made contributions during the black out period. Catholic Charities with current contracts totaling $8,448,820. Several board members made contributions during the black out period. CitiReport selected 14 additional nonprofits based on their high profile in the news or in actions before the Board of Supervisors. In all but one case – the Bicycle Coalition – the record indicates that board members made political contributions prohibited by city ethics laws. While the city law bans contributions in cases involving city contracts, it is silent on situations where nonprofits or for-profit businesses seeking other administrative actions that have monetary value. This loophole allows contributions from those seeking zoning variances, permits, changes in tax law such as the mid-Market “Twitter” change, eligibility for inclusion in empowerment or enterprise zones that include tax breaks, or partnership agreements such as the America’s Cup Organizing Committee. In one case selected by CitiReport – the San Francisco Botanical Garden Society – the loophole allowed its officers and board members to make contributions while it sought Board of Supervisors authority to begin charging non-San Francisco visitors an entry fee to the Golden Gate’s Botanical Gardens. The Botanical Garden Society’s city contract of $4.779 fell well below the trigger of $50,000 that applies to contribution bans. In another nonprofit example – California Pacific Medical Center – the monetary benefit currently being sought regards a controversial proposal to build a new large-scale hospital. CPMC’s contracts totaled $189,450 so the contribution ban applies, although the contract value is far below the monetary interest in the issue of a new facility. CPMC officers and directors did make contributions during the black out period. Two other nonprofits with a strong interest in city decisions that affect them had contracts that fell under the $50,000 trigger, although both had board members who made contributions. They are SPUR and the A. Phillip Randolph Institute that is involved in selective voter turnout efforts. San Francisco Convention and Visitors Bureau with current contracts totaling $3,234,844. The Ethics Commission adopted a staff recommendation that the ban on contributions from nonprofits be dropped from the law at its October 2010 meeting. In a memo to Commissioners, Ethics Executive Director John St. Croix reported that since the first contractor pay-to-play ban was enacted fourteen years earlier, the Commission has considered only three formal complaints and dismissed all three. Nine months after approving dropping the ban, however, the Ethics Commission has yet to find a sponsor at the Board of Supervisors, according to Ethics Commission officials. In his memo to the Commission, St. Croix offered staff reasons for dropping the application of the ban to nonprofits. “I am reluctant to ask my auditors or enforcement staff to review SFEC-126 filings and compare them against campaign filings because the sheer amount of data will make the search wasteful and likely fruitless,” advised St. Croix. Nonprofit organizations also expressed concerns that the ban affected their ability to recruit board members because the board members want to contribute to candidates. “I understand that staff and officers of some local nonprofits are very concerned about the effect of section 1.126 on their board memberships. At a time when the City is relying more heavily on local non-governmental organizations to provide services to residents, some in the nonprofit community are worried that section 1.126 will hinder their ability to recruit board members to help with fundraising and oversight,” wrote St. Croix. The Commission’s Executive Director also dismissed concerns that nonprofits would be motivated by pay-to-play arrangements. “The law would explicitly exclude grants and contracts between nonprofit organizations and the City, School District or Community College District. This would address many of the concerns about the law’s effects on nonprofit organizations and their officers and would lighten the administrative burden by eliminating hundreds of SFEC-126 filings each year,” said St. Croix. Previous post: Commissioners: Pay to Play?